We’re two weeks into the 2019 legislative session, and so far there hasn’t been too much to report. The first week was largely filled with ceremonial events – beginning with swearing in members of the Kansas House of Representatives and Senate, and the inauguration of our new Governor, Laura Kelly. That was followed by the State of the State address, and the release of the governor’s budget proposal. But there is a handful of information I want to go over: The budget, rules changes, and the work that’s happening on the new Rural Revitalization committee. Oh, and I bill I’ve introduced with a number of cosponsors. The Rural Revitalization committee has been incredibly interesting. 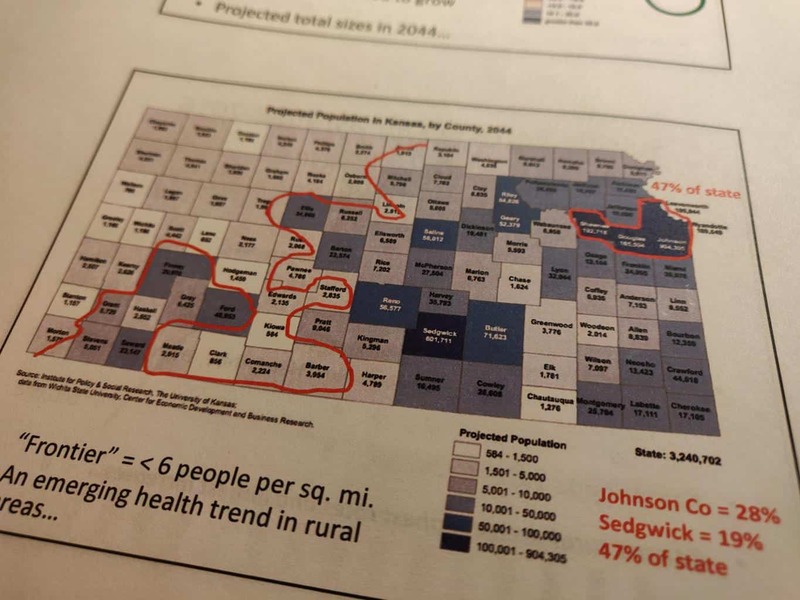 We’ve heard from experts who have studied population trends and who have made projections about what rural Kansas might look like in the next 30 years – if we don’t take steps to mitigate the outflow of people. Looking at the numbers, it all seems rather dire. If current trends continue, large parts of the state will return to “frontier,” while nearly half of the state’s population will be concentrated in the more urban Northeastern Kansas. But the news isn’t all depressing. We also heard from Marci Penner, from the Kansas Sampler Foundation. She shared some stories about communities that have successfully attracted younger people who are “Rural by Choice.” Additionally, she shared some very valuable feedback from these communities about what we in this committee might be able to do to help them grow their communities. I won’t get into all the details here. 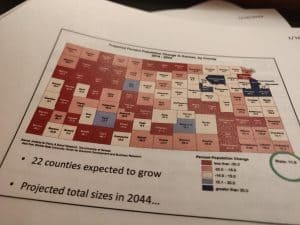 If you want to see one of the more in-depth reports on population changes and trends, you can view it here. 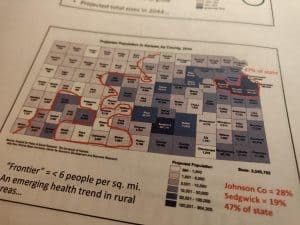 But the bottom line is that there are a number of difficulties in rural Kansas. The population is aging rapidly, and isn’t being replaced with working-age people. These communities sometimes struggle to attract new business that might attract a workforce – and there are a number of reasons for that, including often high local property taxes, onerous regulations that aren’t tailored to small, rural towns, and poor access to high-speed broadband. The first order of business in the House was to adopt new rules for the next two years. There was a decent amount of debate about this, and some division within the Democratic caucus about whether the rules were adequate – particularly on the issue of transparency. I wasn’t 100 percent happy with the rules we adopted, but it contained some elements I was happy to see – namely, what I view as moderate progress on the gross overuse of the Gut-and-Go practice. If you don’t know what that is, let me explain it. When the House and Senate can’t agree on something, or when a committee really wants to push out a piece of legislation but is running out of time, you’ll start hearing talk of “shells” and “vehicles.” These are bills that can serve as a vessel for some other piece of legislation. Essentially, we’ll “gut” one bill, replace it with the contents of another bill, then “go” ahead and vote on it. When we’re done, we tell ourselves, and the public, that this bill has successfully been passed out of committee, and both the House and the Senate. If your head is swirling, don’t feel bad. It does the same thing to me. Basically, it’s like two people can’t agree on what to drink. One wants milk, while the other wants Coca-Cola. Instead of working together toward a compromise in which both get their drink of choice – just maybe less of it – “Gut and Go” is like the guy who wants milk buying a bottle of Coca-Cola, dumping it out and filling it back up with milk – and saying that we should all be happy with how things have worked out. We didn’t end the practice, but we did create a mechanism to track it. I’ll admit it’s imperfect, and will likely still be hard for the average person to track down. But it is progress – and that’s a big deal to me when a year ago, I was basically told I didn’t know what I was talking about and how Gut and Go is a very important tool that was needed to get anything done in the Kansas Legislature within the 90-day window we’re given. Another rule change will ensure that there’s a way to find out who introduced a bill. In past years, it’s not been uncommon for bills to be introduced by committee as a way to shield the legislator who carried the legislation. A number of us in the House have called for an end to this practice. Again, we didn’t get all we wanted – which was the carrier’s name on the bill – but it will be included in the committee minutes, so there’s at least some way to find out who is carrying water for whom. One rule change I didn’t like was an increase to from 63 to 70 members needed to pull a bill above “The Line” for open debate on the House floor. This is a seldom used technique that doesn’t often result in forcing debate on a bill. I have some misgivings about moving from a simple majority to a super-majority. But on the whole, I feel that’s a small compromise to give up to get some progress on transparency. The hot button issues this year will be Gov. Kelly’s budget proposal and taxes. I’ve not had the chance to fully dive into it, but there are some things I like about her proposal. First, it contains a 9 percent ending balance – above the required 7.5 percent ending balance we must have. In her State of the State speech, Gov. Kelly clearly explained that Kansas is in no way prepared for an economic downturn or a big natural disaster. Setting back more money for such an emergency is wise. Additionally, she’s investing additional resources to our child welfare system – which has been mismanaged and underfunded in ways that have led to trauma, harm, and even death for children in this state. That is completely unacceptable, and I’m glad to see the Governor focus on this. It also contains money for Medicaid expansion, and works to fund education at a level that will meet the Supreme Court’s ruling and bring an end to long-standing litigation over education funding. I think it’s time to bring this contentious issue to a resolution. And it’s beyond time for us to expand Medicaid. Gov. Kelly has promised that she won’t ask for a tax increase this year, and she hasn’t. Yet, thanks the changes in federal tax law, the case is now being made that if the state doesn’t take action to adjust its tax laws accordingly, we’ll, in effect, be raising taxes. This is another complicated and cloudy issue. My primary questions are how much such changes might cost the state, and to whom the benefits will fall. I keep hearing how this will “return money to Kansas taxpayers,” but my experience tells me that doesn’t often mean the working stiff. More often than not, it’s some of the biggest companies that stand to gain the most. And based on the push that came at the end of last session on this issue – and the finely dressed, out-of-state lobbyists that descended on Topeka to advocate for this tax change – I can’t help but be a little suspicious about who stands to gain from this. My initial guess is that it’s not you and me. Here’s a link to the budget overview. This week, I introduced HB2074, along with a number of cosponsors. The short version is that this bill will create a state-level protection across all types of health insurance for people who have pre-existing conditions. When I first started working on this bill, I assumed that Kansas would have weak, if any, protections for pre-existing conditions. I was wrong. After some work, the revisors found that we do have protections for large and small group policies, but not for individual policies. This bill will address this omission by simply declaring that “every” policy sold in Kansas must accept a person, regardless of prior health issues and that once covered, they can’t deny appropriate treatment. To me this bill isn’t controversial at all. In fact, it seems to codify state law in a way that extends current law to all types of health insurance. Why is this necessary? Well, I have little faith that the current protections outlined by the federal government will remain in effect. A Texas court has issued an unfavorable ruling, and there’s a push in Washington, D.C. to erode such protections. It seemed appropriate to me that we look to create a state-level protection for our residents, so that we’re insulated from whatever happens in the nation’s capitol. I am interested in talking to you about Western Kansas, sometime during Summer. Jason — thanks for a very informative and thorough update. Your journalism skills combine so well with your legislative work. Very pleased about the bill you just helped put forward concerning health insurance. Your son has one great dad to stand with him!